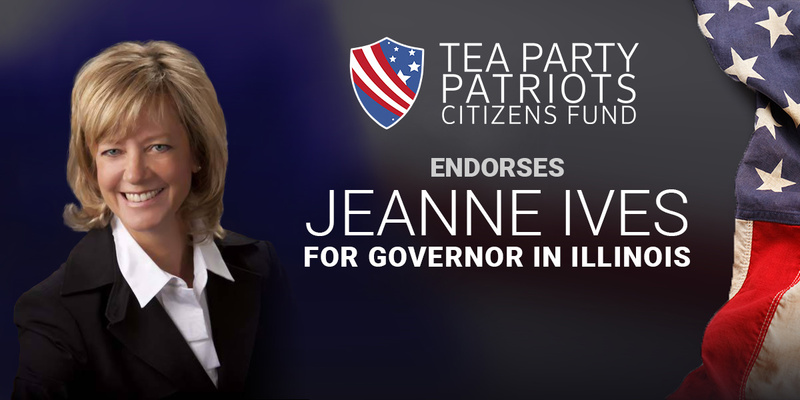 ATLANTA, Ga. – Tea Party Patriots Citizens Fund (TPPCF) Chairman Jenny Beth Martin today released the following statement, announcing that the Super PAC associated with the nation’s largest Tea Party group has endorsed Jeanne Ives for the GOP nomination for governor in Illinois. “Sadly, that liberal governor is a Republican – a Republican who campaigned four years ago as a conservative, making promise after promise to assuage the concerns of conservative Illinois voters, then betrayed them once he took office. “Luckily for Illinois, there’s an alternative – Jeanne Ives. From all over the state, our supporters have urged us to endorse Jeanne Ives for governor, and it’s easy to see why. A West Point graduate, she’s a three-term state representative with a proven record of fighting against job-killing tax increases and for reduced spending. She opposes the state’s status as a so-called ‘Sanctuary State. And she strongly opposes taxpayer-funded abortion. “On March 20, Illinois Republicans will have a choice to make. They can choose between continued support for the liberal status quo by voting for the incumbent governor, or they can opt for the path of conservative reform championed by Jeanne Ives. For our supporters in Illinois, the choice is clear – they want Jeanne Ives to serve as governor.